Hey,hey there! 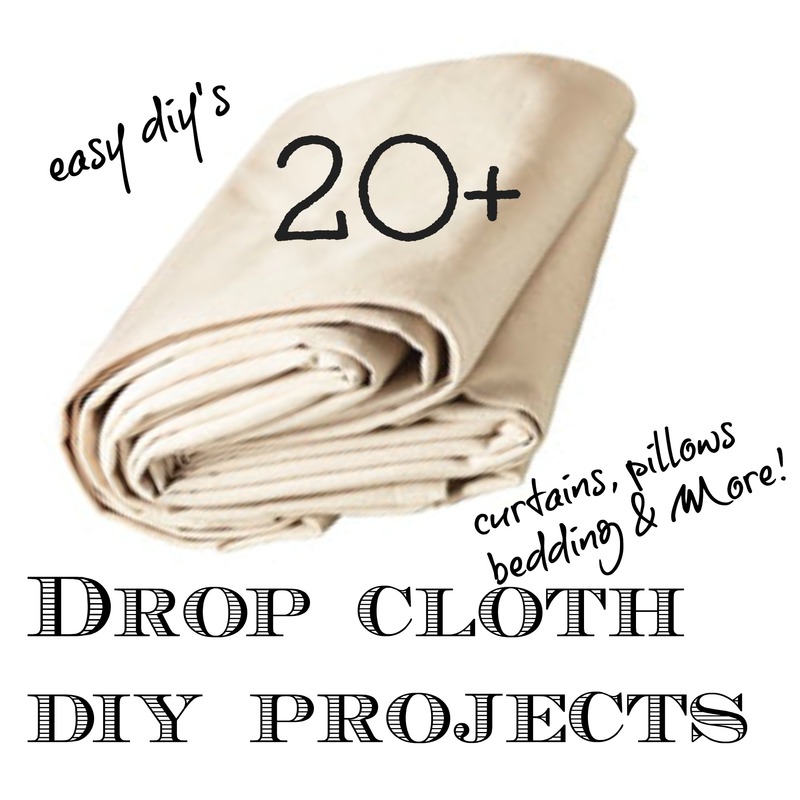 Today, I am sharing some projects I have done in the past out of drop cloths. 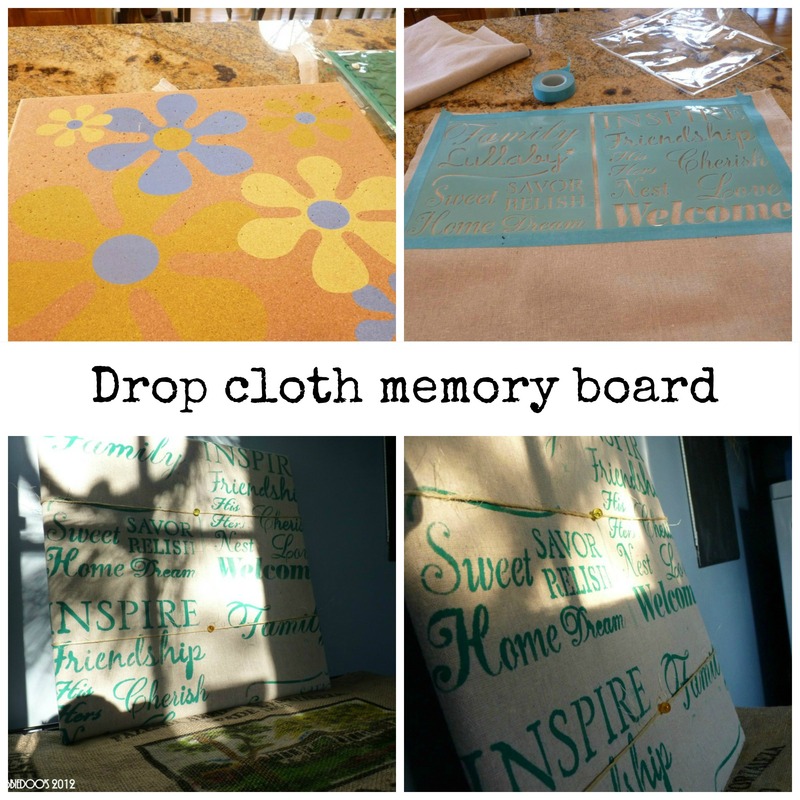 They are diy projects out of drop cloths you can do inexpensively and they look great! You know how inexpensive drop clothes, better known as Painters tarps are? You can get a lot of mileage out of one. WOW,that was two years ago already! These too as well, were painted and stenciled. Both rooms pretty much remain the same. 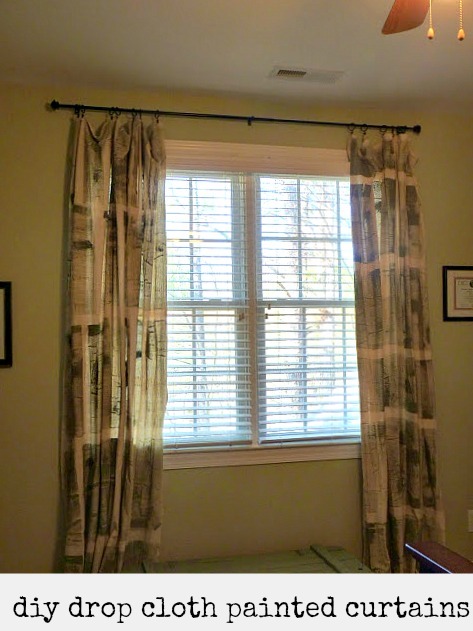 No need for changing these drop cloth curtains out, as they go with everything! an easy diy memo board facelift. 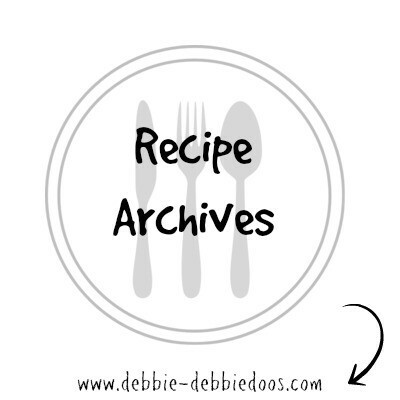 I share all things heart, home and a recipe or two on occasion! You definitely got your monies worth out of your drop cloths, Debbie! I have some soft ones I picked up from Lowe’s. I’m hoping they will be even softer once I wash them. I’m going to make another set of chair slips for our dining chairs with them. I’m also hoping I have enough left over drop cloth from my master bedroom side table skirts to recover a little footstool. Oh so cute!!! 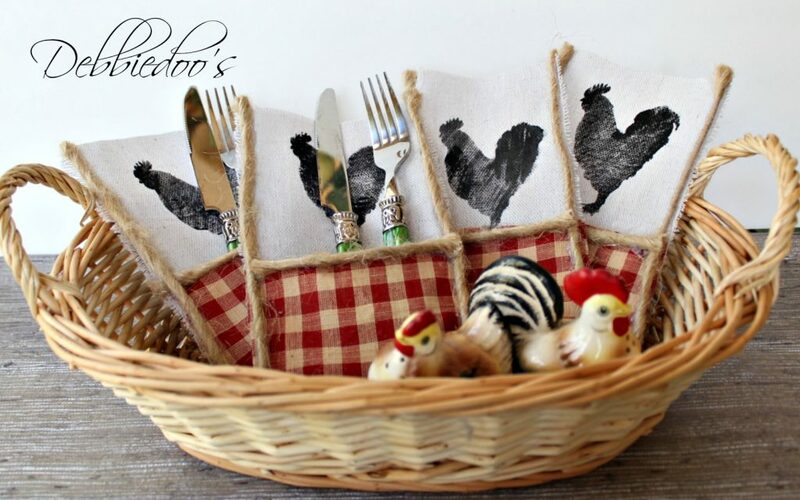 Really love the utensil holders with the rooster stamp. Why am I so drawn to roosters??! Me too Anne, I don’t know why I love them soo! Debbie, such creative ideas!!! 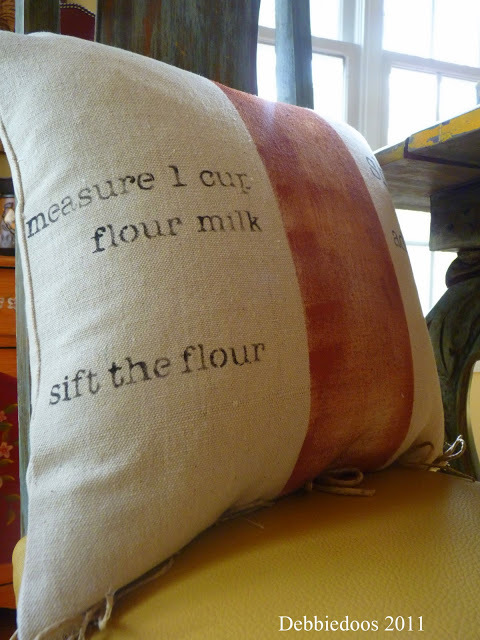 I love the kitchen pillow! I’m thinking about slip covering a little settee with a drop cloth. I just need the TIME!!! You blog is so inspiring and so are you! Hi Holly, I used plaid craft paint. Now keep in mind, I won’t be washing this pillow. I know they sell washable crafts paints as well. But Plaid is always my big go to…great colors too. 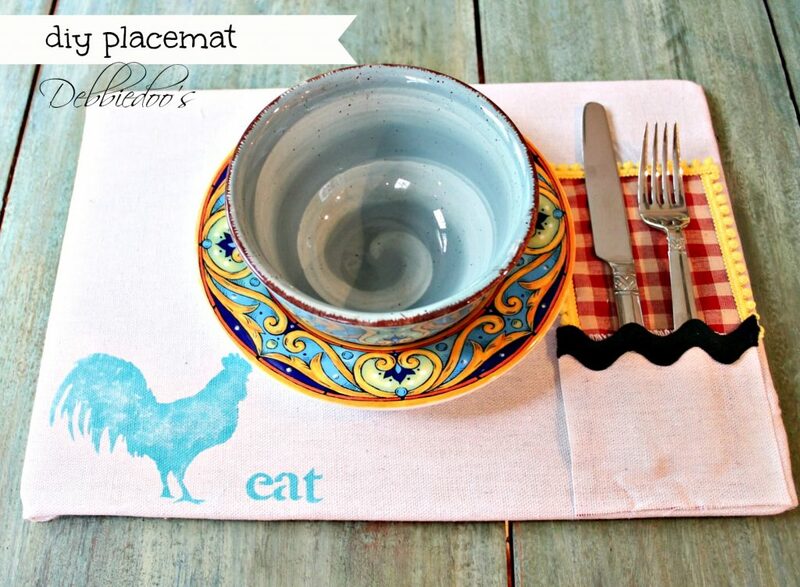 I love these cute drop cloth ideas. I really love the utensil holders too also the memory board. That is too adorable. Rooster are habit forming!!!!!! 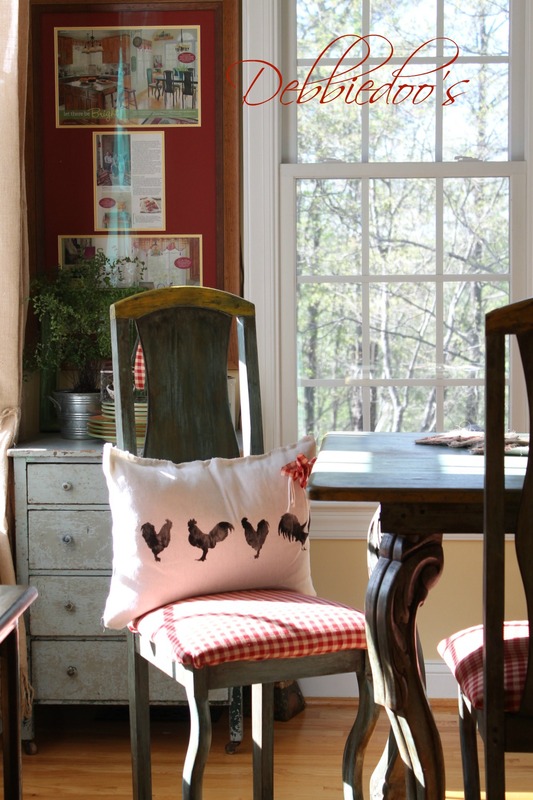 You have done some neat projects with this thrifty fabric…luv those holders and that 2 year old pillow. Debbie when do you sleep? I love it all. You are so clever but the rooster items are my faves. I love anything and everything drop cloth! my favorite material! I look every time I go into home depot for their “special” deals…. they are so cheap when they do it that way. Sleep at night when y’all all do..a good solid 7 hours! Hi Debbie. What a coincidence. I am headed to Lowe’s today for a new drop cloth. 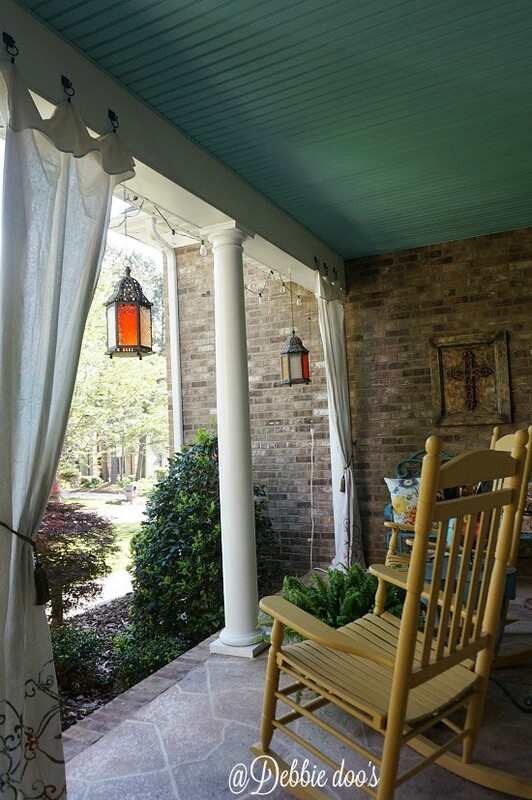 I want to put one up on the covered patio to finish off my outdoor room. I love me some drop cloth projects! You have made some beautiful things, Debbie. I love all of these ideas, Debbie! I never thought to paint drop cloth. I love the stenciling, too. I have a ton of this stuff…time to use it!! I have the drop cloth all ready! I love the look of drop cloths, too! I’ve recover chairs with them, and created backdrops for Junk Bonanza with them, too! 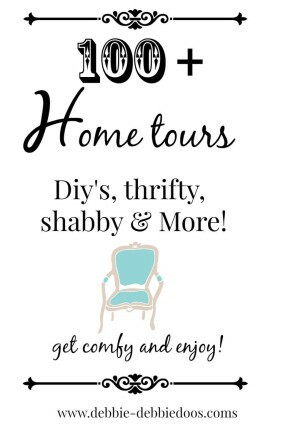 You are the Queen of drop cloth projects. Love them all! What a fantastic group of projects! Lots of inspiration here Debbie – thanks for sharing this great roundup! How cool, I can’t believe you made all of that with drop cloths! I’m going to have to get some drop cloths! Such great ideas!! You are the reason painters are slopping paint all over the southeast. Naughty girl! You are awesome as usual. Ilove them too, I covered to chairs with them and made an area rug with one, I shellacked it after painting it, I made tote bags, a sewing machine cover and big sac to hold my kids soft balls and basket balls, I LOVE these drop cloths!! hope I am looking at same drop cloth you guys are. says made out of canvas, 9 x 12 $20.00. Just wasn’t sure if that was good or canvas to heavy, but love the look of yours. The shelf said painters drop cloth, should there be something different that says tarp on pkg.? make them yourself or do you buy, and is it just material paint you use. Hi Tracy, nice to meet you. 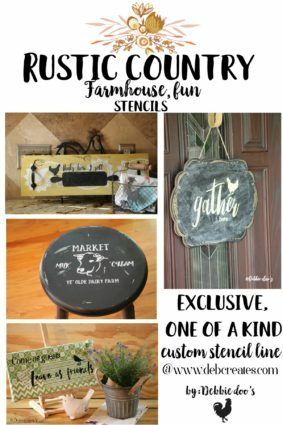 I get my stencils from any hobby shop, even Walmart has some stencils. People do make them as well, but that requires a special paper and printer which I find buying them much easier. Yes, any craft paint will do. I may have missed this, but wondering if you wash the drop cloth first. I heard it shrinks really bad. Does it lose shape by washing before? I want to make some curtains and dont expect I will need to wash them a whole lot and I don’t want them to lose their shape. I love all things drop cloth. 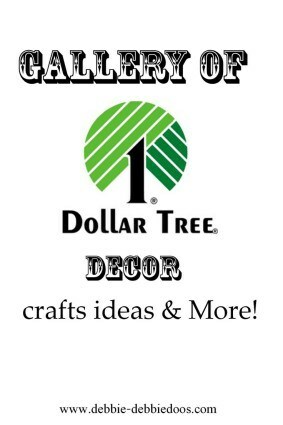 I’ve done covered chair seats with them stenciled, and wreaths on wire frames. Waiting til I can get curtains done for the cottage.